Welcome to the Association of Learned and Professional Society Publishers blog. It includes helpful posts to connect, inform, develop and represent the scholarly publishing community. 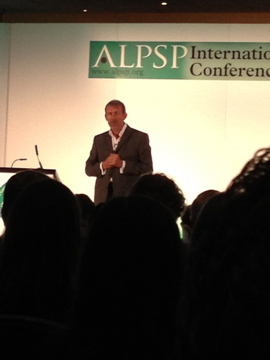 Day two of last week’s ALPSP conference saw a new departure for the programme with a session focusing on how to radically improve the way your organization operates. Speaker Arend Welmers specializes in helping organizations execute their strategy. He provided an outline of the Open Book Management and Quantum90 approach to use the power of people to rapidly transform organization performance. Here are the highlights from his talk – essential for anyone considering organizational change or transformation. Most people when asked what their role is in an organization will probably describe it in a way that is something to do with their role or linked to your job description. This is what is called functional thinking and is a disease in most organizations. So marketing = campaigns; finance = count money; technical = build wonderful technical platforms. In fact, this is only partly right. There’s a second job most people are also – or should be – doing: a role in helping the organization to make more money, to grow and be more profitable. Whether you are not for profit or for profit or mission driven, you are competing in a market place. There are people out there trying to come up with better ways of doing what you do. You are responsible for the fees your organization generates. You can’t just participate; you need to compete in your market. And don’t be under any illusions: there is a market for the area you are working in. Everyone in an organization has two roles: functional expertise and the competitive inclination of the whole team. This is about participation in the business of business to make the company more successful. Most organizations start with somebody who has a great idea. They bring people together and provide the drive to work on a passion. This excitement, the energy, focus and purpose is what helps the company start to perform. As an organization starts to be successful, the founders that have the passion need to recruit specialists to help them develop. But they are not about the company; they are focused and passionate on what they do i.e. setting up a great appraisal system. They take a functional approach. How often do founders sit down with new recruits to tell them why you should join and help them make money or make the organization successful? It doesn't happen. You need to get everyone in organization thinking along these lines from whenever they start. If not, the growth curve will flatten out. Many businesses are on the point of going downhill. What happens at the bottom? There are drives for employee engagement: and while the intention is right, the results tend to be poor. Nobody will take accountability where they don’t own what they are acting on. Do you want all employees acting, thinking and feeling like they own the business? Isn't that the sort of company you’d invest in? Why don’t all businesses run like that? Often, people come into an organization and want to do a good job, but can’t help change or influence because they are not allowed to: management don’t know how to tap into the innate need to win. Open Book Management is an approach that creates a high involvement culture in the business. How do we create an organization that performs in this way? 1) Identify weaknesses or opportunities of running the organization to get everybody participating. This is a great way to get those who know a function or job well to be able to work out the challenge and figure out how to fix it. People get really creative if you give them the opportunity. Tip: Set a seven day challenge. Generate huge excitement that will generate change. Quantum90 challenge is also a model to consider. 2) Build a high involvement culture in the business. This takes a little longer. It starts with sharing much more information in your business with everyone. Share information on how the business is performing and make sure the team understand what it means. 3) Consolidate this work by giving the team the skills, knowledge and information to empower them so they make better decisions. This in turn makes it easy to manage them and make change. If you then have the courage to entertain notion of spreading the wealth that you create among the people who generate that wealth you can move from participation to engagement to a terrific outcome. It only seems fair that the outcome should be shared. Further thinking on this approach is available here.